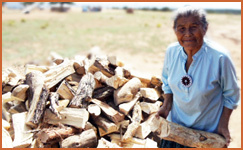 The SWIRC Program's Winter Fuel service recently partnered with the Smith Lake Senior Center on the Navajo Reservation in New Mexico to deliver much needed wood to the Elders of the community. The enthusiastic Program Partner, Jennie, met with our representative and wood vendor to make deliveries to Smith Lake Elders. Two Elders were home during these distributions and accepted the generous gift of warmth. Both Elders were excited about receiving their share of wood before the cold weather starts creeping into their homes. Alice is elderly, but you would never know this by her physical abilities. 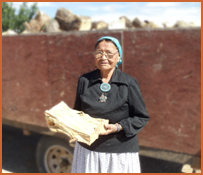 When the trailer full of wood pulled up to her house, she was quick to greet the delivery and was all smiles when she saw the amount of wood being given to her. Alice currently lives with an adopted daughter who helps Alice and keeps the home in order. Their income is limited to the SSI benefits and Veteran benefits Alice also receives. Her husband has passed on, but Alice stays active and remains social with friends at the Smith Lake Senior Center. She enjoys the Healthy Living service sponsored by the SWIRC Program as well. Alice keeps fit by walking a mile a day, and she recently earned a new pair of shoes for her particpation in services offered through the Senior Center and supported by SWIRC. Lindsey is also elderly and was on hand to welcome the delivery of wood. She shared, "I get my wood from anybody who is willing to sell it." The costs to Lindsey range anywhere from $60-$150 depending on the quantity and quality of the wood. Her only source of income is a monthly SSI benefit, which helps her sustain two growing grandchildren over which she has legal guardianship. She tries to budget to make her limited resources last longer, and getting this load of wood will definitely help the household. More importantly, the wood will help keep Lindsey and her two grandchildren warm during the cold winter months that are fast approaching. Support from friends like you helped make this service possible for these Elders. Thank you!